Enhance your space with vibrant, functional art created for your tables and floor. A brightly coloured Lizprintz creation can tie together both neutral and bold surroundings. For the floor: pet mats and floorcloths. Each Lizprintz piece is handcrafted and painted with rich colour. All designs are original compositions and no two creations are alike. Available at the Salt Spring Saturday Market (April – October) or by custom order. Please contact us for details. 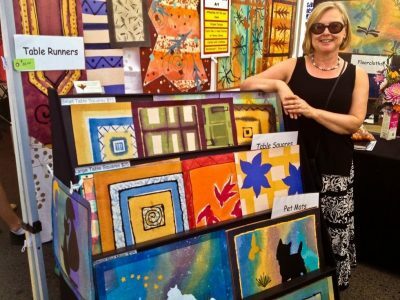 Elizabeth, the artist behind Lizprintz Creations, is fascinated by opposites: function versus beauty, tradition that incorporates innovation, and happy accidents that contrast with careful planning. 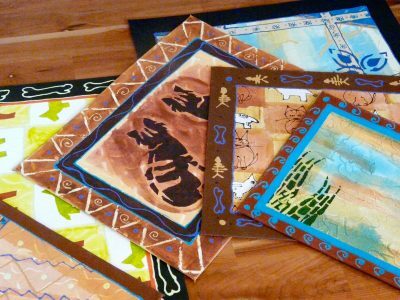 Each floorcloth, set of placemats or table runner is created using heavy canvas, acrylic paints, brushes, found tools, original stencils and painted designs. Once complete, several layers of water-based urethane are applied to ensure easy care and durability. © 2019 Lizprintz Creations. Site design by Rob Hailman.